Rocky road is one of my go to recipes when I need to make lunchbox snacks for the kids. It's delicious, easy to make and more importantly you can make it using any leftover biscuits/sweet/fruit you have leftover in your cupboards! Bonus! 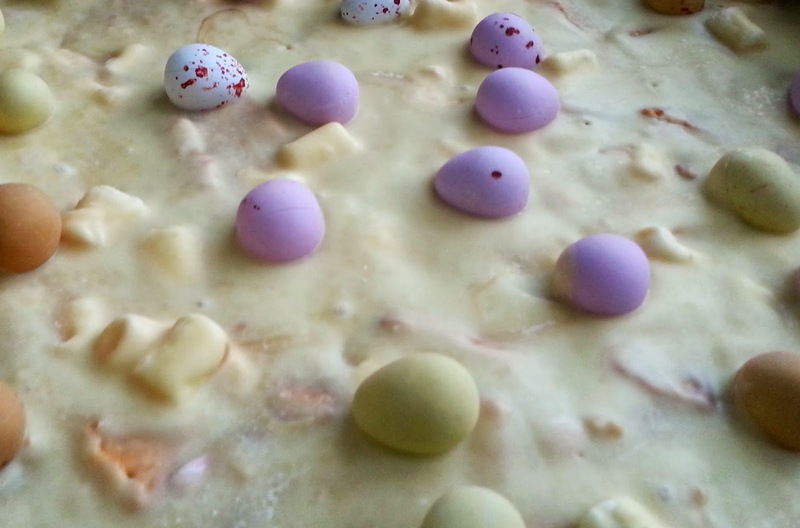 My store cupboard is unsurprisingly filled with Easter treats right now and I have HEAPS of white chocolate leftover from a mammoth ganache making session in the bakery last week, so I decided to try out a white chocolate rocky road recipe. I always make my rocky road with dark or milk chocolate so this was new territory for me - and luckily it turned out delicious. 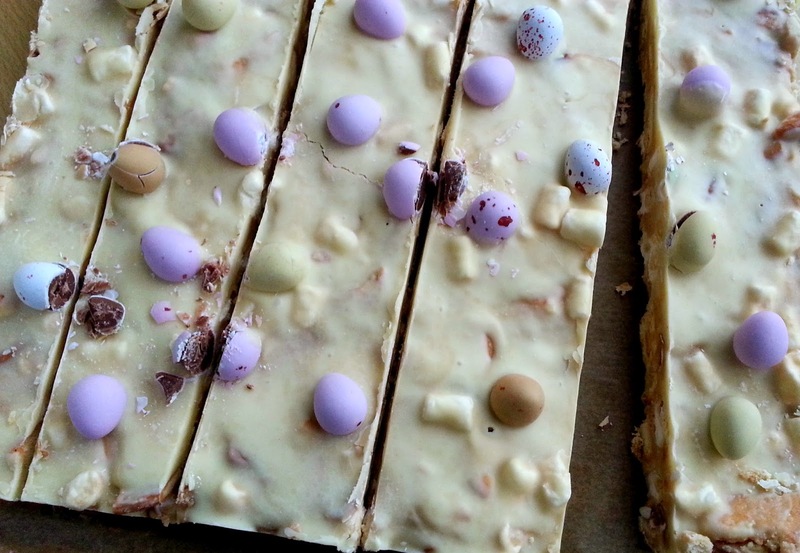 I did find I needed to use a lot more white chocolate than in my usual rocky road recipes, and I thought it would make the bars teeth achingly sweet, but actually the addition of the plain rich tea biscuits cuts down the sweetness. I'd still recommend cutting your bars into small squares though (I got approx 25 large pieces out of a 10" tin). Unless like me you have a mega sweet tooth then by all means, go super size. Other flavour additions that have gone through my mind include: maltesers, sliced snickers/mars bars, nuts, dried fruit, yoghurt covered raisins, frozen jaffas cut into small pieces, ginger biscuits, rum soaked fruit, pretzels, ready salted crisps etc. The combinations are endless! Line a 10" square tin with greaseproof paper and set aside. Melt chocolate (500g), butter and golden syrup together in a large bowl using the microwave. This takes about 1-2 mins but keep an eye on the mix as white chocolate can burn quickly. Pop the biscuits into a freezer bag or bowl and break them up using a wooden spoon or rolling pin. I don't like big lumps of biscuit in my rocky road so I crush them up quite well but do it according to your taste. Add broken biscuits and marshmallows to your melted chocolate mixture and coat well. Turn into your prepared tin and use a spatula to push the rocky road into the corners of the tin. 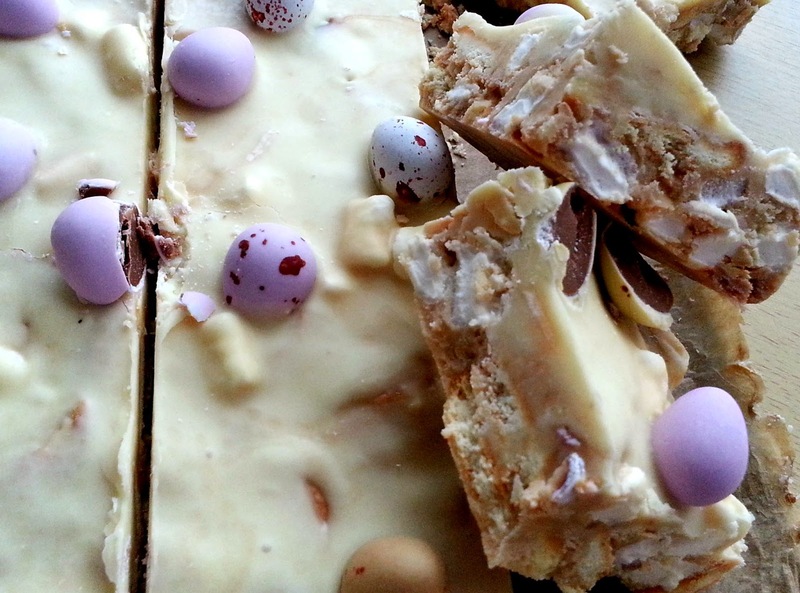 Melt 100g of white chocolate and pour over rocky road before sprinkling over mini eggs. Refrigerate for a few hours before cutting into squares and storing in an airtight tin. Rocky Road will last for about a week in a tin.